There is several reasons behind money losses in the Forex market. Acording to the statistic, there is aprox. 10% of traders who makes profit. Based on that, 90% of them are losing money, or 90 of 100 traders are losing! Why? Trading Forex provides abnormal procentage earnings in the short term and therefore there is a huge possibility of loss as well. Each FX trade is risk and how big that risk would be depens on you and yourself only. Don’t look only at earnings potential, always look at the possibility of loss. Low risk and loss limit/stop loss will save your account. Why? Stop loss is protecting your capital from too big loss. Market could go anywere with no particular reason sometimes and you must protect yourself in that case. If your SL will be hit, then you didn’t have a good position. Losses are the part of FX trading and there is nothing wrong about that, if you have limited your risk. In the begining of my FX career, the worst thing I have experienced in the market was not placing my SL, after wich I waited for hours for price to turn in my favor, hoping and praying. That is not trading! Limited you’re risk and there is always another chance, there is always another opportunity. Never take a too big risk! If you take a too big risk, there is posibility of huge loss. Let’s say that your capital is $1,000 and you have taken a risk of 50% of your capital in one trade. That means, that you are risking $500 in one trade. This is not strange, traders do that often. If you lose that position, you have lost $500 or 50% of your capital. Now, you must make a 100% gain in the next trade to be with your capital at zero, or to be again on the start with $1,000. That is not easy to make! If you lose 90% of your capital, or $900 of your $1,000 capital, you must make a 900% gain to return to zero. That’s almost impossible, always think of that! Quick and huge loss is very difficult and most of the time it’s imposible to return! Why? It’s not only a matter of your trading skills and expertise. There is a question about psychology as well. Each trader want’s to return the loss quickly as possible because he’s thinking of this. ‘I lost my money quick, I can return it same way’. But, that’s not possible because you are not able to make right decisions short term with huge loss thinking on your mind. Pressure is to big. You must be calm for trading with no emotions at all. It’s easy to lose big and it’s not easy to return that! If you risk to much in one trade, maybe you will need days or weeks to cover that loss, if you manage to return it at all. Huge and quick loss will make the extraction where you just make mistakes in order to get back as soon as possible and you will eventually lose everything. It is an unwritten rule! Trust me, I felt it a few times at the beginning of my FX career. Don’t use large leverage on your account! Bigger leverage is, bigger risk is and it’s easier to lose or to burn your account. If you have laverage of 1:500 or more, you can easily lose your entire account with only one or two trades! If you have to big leverage, you have the ability to go out on the market with strong orders, regardless of what you don’t have a large capital. With the desire for maximum profit, you can easily make a huge loss in such a way from which you can not return. Be aware that, is’t not normal to make a $2,000 trade with $1,000 capital! Is it possible? Yes it is, but you must take a too big risk for such a trade and you must risk your entire capital or 100% of it. That’s not normal and only fools could do that. Trade with low leverage such as 1:10 or with 1:25 and you’re account will not be in huge risk. I am trading with leverage of 1:10 in 2016. Based on my experience, risk management is the most important rule in trading. 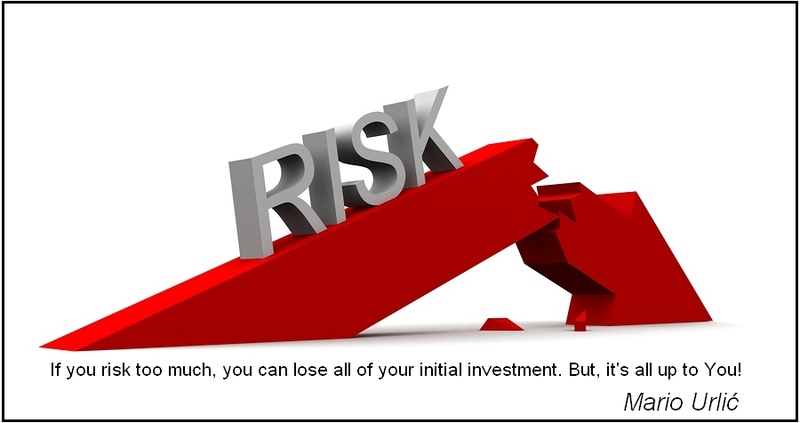 You must have your own risk management in which you will set up your risk in each trade. Don’t risk more then 0,3% to 0,5% of your capital in one trade. If you lose 2 or max. 3 orders in a row, quit trading at least 24 hours or more! If you lose 3 orders in a row, withdraw all capital on your bank account and start again several days latter! Why? I explained that in my earlier text. Beacuse you must trade calm and with no emotions. If you lose 10% or more of your account in a day you will be angry and you will want to take revenge. Don’t do that! It’s better to withdraw the money and to try some other time, few days latter. If you leave the money on your trading account, you can try again and if you withdraw the money you will not be tempted. Trust me on that. For all my opinions, analysis, setups and trades posted here I will not accept liability for any loss or damage, including without limitation to, any loss of profit, which may arise directly or indirectly from use of or reliance on such information. Risk management is your personal reposibility!